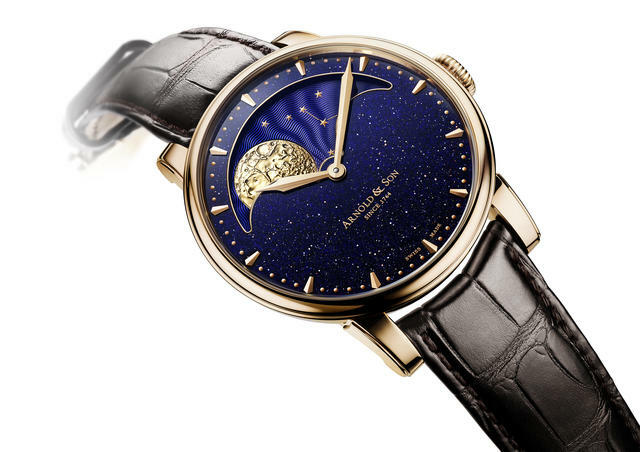 (Sponsored post) For many classical watches, a lunar display seems to be an afterthought. A small window at the bottom of the dial exposing a cartoonish moon or a yellow circle that we too often have to squint to see on the dials of so-called ‘moonphase’ watches hardly does justice to our favorite satellite. 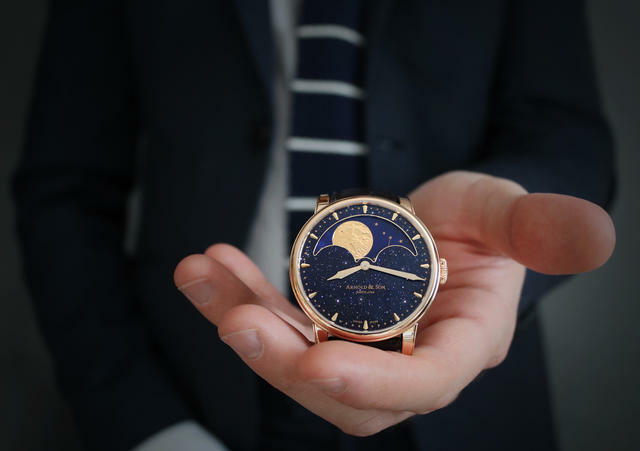 More than five years ago, Arnold & Son changed all that with its first HM Perpetual Moon, a 42mm model with one of the largest moonphase displays ever seen on a wristwatch. At 29mm across the top of the watch’s dial, the lunar display is clearly the point here, particularly with its massive 11.2mm moon disc. In the years since Arnold & Son launched the watch, the Swiss watchmaker (with a distinctly British accent) has introduced HM Perpetual Moon watches in several different case metals, always with interesting dial treatments. 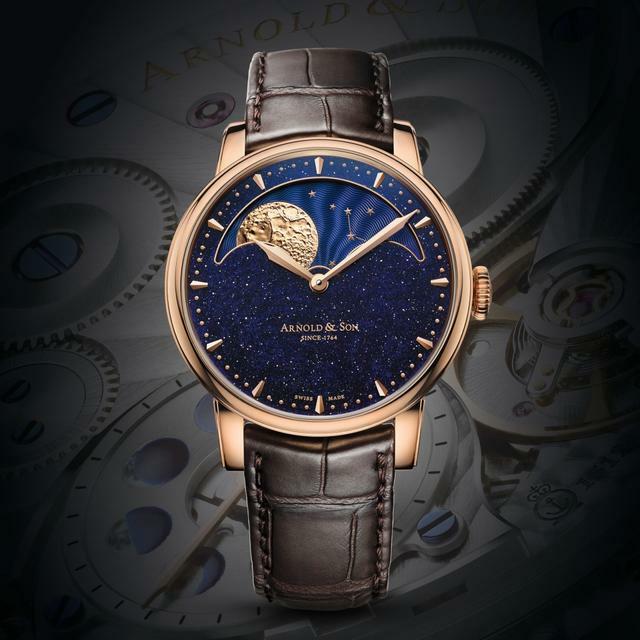 For 2019, Arnold & Son unveils a new version of the HM Perpetual Moon with a blue Aventurine stone dial that vividly recalls a clear night sky. 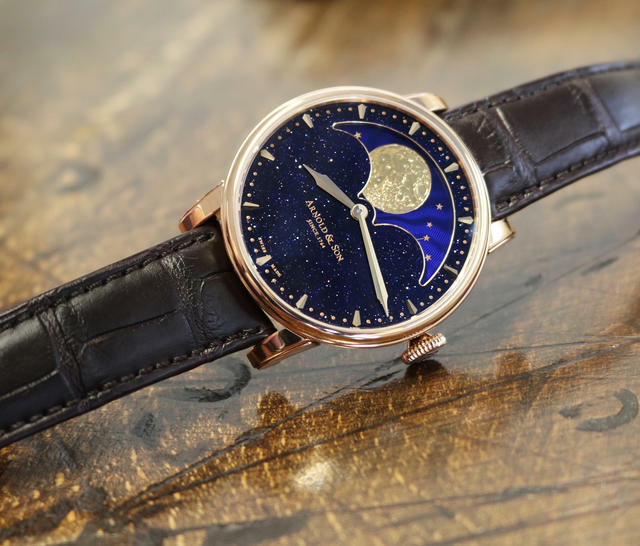 Housed in red gold, the new watch again features Arnold & Son’s mechanical hand-wound movement, Caliber A&S1512, an integrated (non-modular) moonphase caliber propels the orbit of its large moon with superior precision. The caliber is easily one of the most accurate moon phase indicators on the market, with only one day’s deviation every 122 years. Even better, the movement’s double barrel yields an extra-long ninety hours of power reserve. Let’s take a look at the moon itself. The orb, a particularly realistic recreation of the moon, is sculpted in three dimensions, first hand-engraved and then duplicated in an 18-karat red gold plate. The sculptured moon is then inserted into the guilloché disc. The watch also has a unique, easy-to-set feature thanks to the ingenious addition of a second moon indication installed at the back of the movement. This second moon display, visible via a transparent case back, features a graduated dial and a pointer hand that allows a more exact setting. 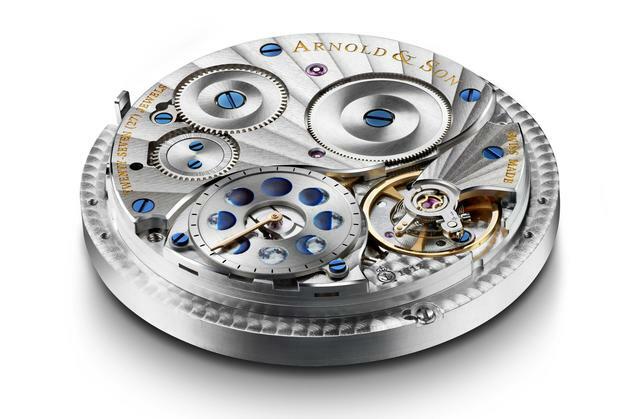 Arnold & Son manual-wind A&S1512, showing moonphase setting feature on back. 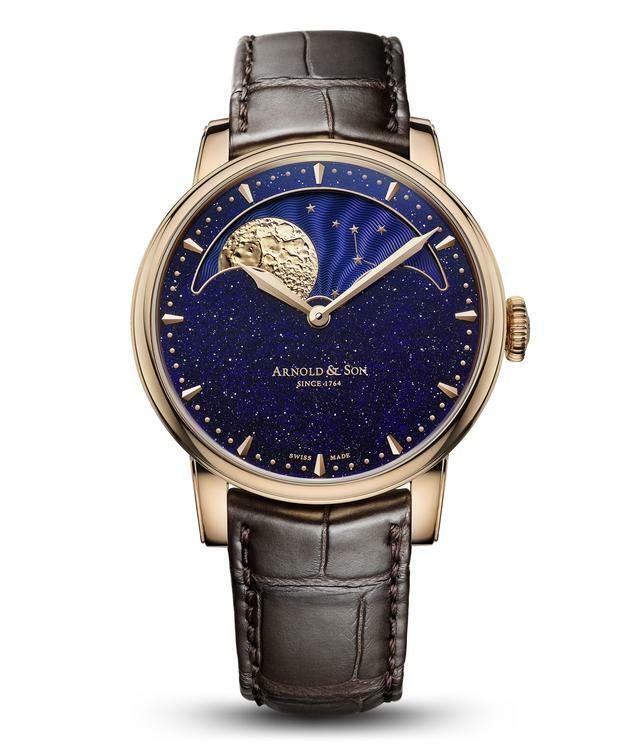 Priced at $33,650, this new Arnold & Son HM Perpetual Moon is a limited edition of 28 pieces.